He seemed to fumble somewhat through his notes as he recanted the many “guys” that paved the way for other “guys” to make it. I’d heard him give a similar speech before, in his usual, humble way giving credit to the many he worked with through the years, the ones who made his career possible. Still, I sat riveted and deeply moved, along with many others, as a legend stood before me. 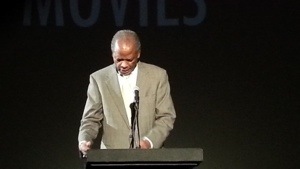 Sidney Poitier – class and dignity personified. I’d heard that said so many times before – said it many times before myself. But I never realized the strength of that truth until tonight. 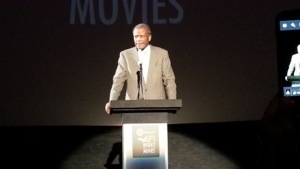 Mr. Poitier was at the Cinerama Dome in Hollywood as part of the AFI Night at the Movies to introduce Norman Jewison’s, In the Heat of the Night (1967), in which he stars opposite Rod Steiger. Two performances, forces really, one doesn’t easily forget. The film was great, my first time seeing it on the big screen, but seeing the man I will never forget – the somewhat frail man that stood before me moments before. A frailty, by the way, evident only as he walked to and from the podium where he presented his introduction. Otherwise, only that familiar serenity was apparent and for his 86 years, he looks wonderful. 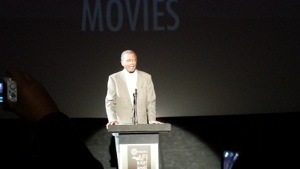 Then, the screen legend, who received the AFI Lifetime Achievement Award in 1992, finished his introduction by thanking the audience and (basically) everyone who’d made his career possible. He went on to say that at 86, he would never go on a stage again but would continue to write until the day he dies. As Poitier walked off to enthusiastic applause and sincere admiration, he stopped and raised his arms several times – as if in triumph. A triumph has been his life, no doubt. Or at least that’s how I interpreted the gestures – but a triumph he humbly thanks all of us for, as well as the many who made his dreams come to life through the years. I don’t know what else to say, nor am I completely coherent, in truth. 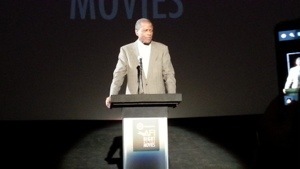 Tonight I saw “LEGEND” up close – Sidney Poitier. 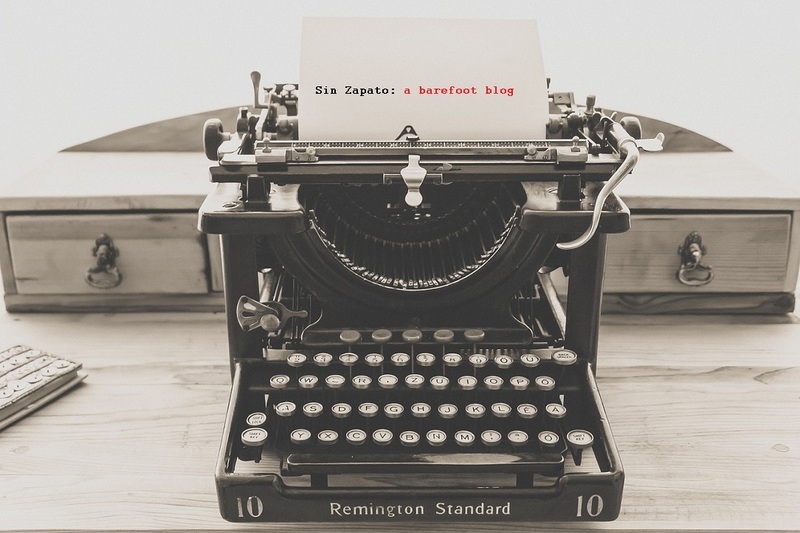 Wow, you even blog well on the road! Such a great experience! I saw Shirley MacLaine last night introducing “Terms of Endearment.” I’m so glad AFI does these things. Thanks, Lara! It was a difficult decision to make since there were so many playing at the same time with wonderful introductions. 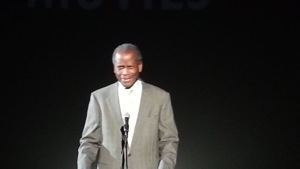 But in the end, I was happy to have chosen Mr. Poitier! Wonderful tribute. I felt a little verklempt while reading it. Thanks for sharing this experience. I’m glad you enjoyed it, R.A.! Aurora, I am jealous! But also thrilled that you shared this with your readers. I’m a huge Sidney Poitier fans and IN THE HEAT OF THE NIGHT is a favorite. It’s hard to think of another actor who made better, more enjoyable films in the 1960s. 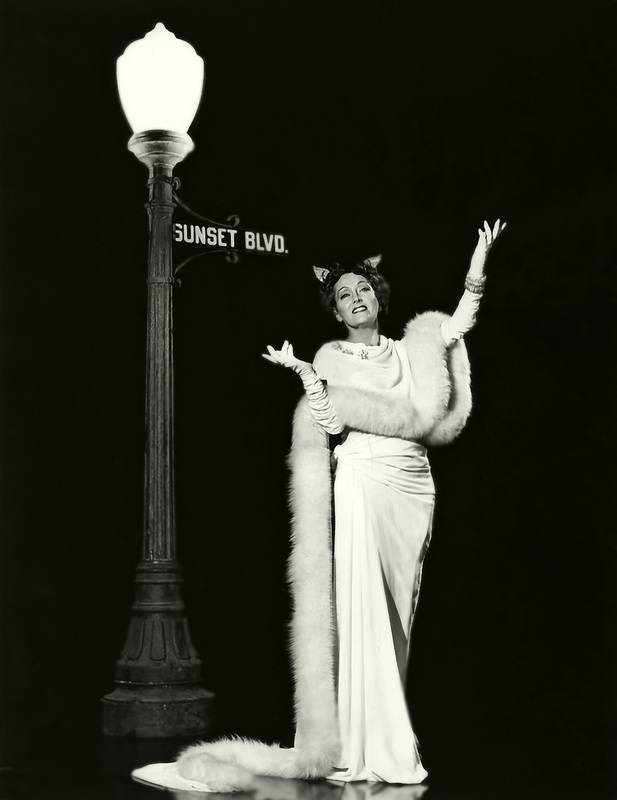 Great pics of a true screen icon! I was so blown away, Rick! A true legend, indeed. I’m so happy you enjoyed these pictures I couldn’t wait until I was coherent to share!